Do you think your character could use some company on his/her adventure? Not impressed with the human PCs? Do you have a character in mind? Look no further, for "Partners" are now officially added to the PANE RP!!! NPCs: Temporary filler characters used to advance the plot of a particular RP. This can be as simple as a cashier working in a pokemart or a family member making an impromptu phone call. Other times, it can be a minor villain acting as the main antagonist in an RP. Usually, these NPCs are around for one RP, but they can reappear in another later RP. Unless otherwise noted, you shouldn't need permission to create an NPC. NOTE: Player-created NPCs will require permission from the creator to use (unless otherwise noted). NPCs like the various Nurse Joys/Officer Jennys do not require permission. Partners: Characters like Meiko Omura, these characters are a mix between PC and NPC. They act as a frequently recurring character, often accompanying the main character in his or her travels. These partners tend to be good friends, advisors, slaves, or even significant others. Other times, they are rivals to the main character, appearing often throughout the story. Partners are free to pursue their own goals (example: main goes for gym battles, partner for contests, etc) and share level average with the main. Permission is required before acquiring a partner; this means that a mod will have to approve a profile for the partner. 2. The partner must be within the same thread as the main character. That is, the partner can't participate in another RP different from that as the main character. 3. A partner serves as a supporting character, while the main usually has the majority of the spotlight. You can't play solely as the partner. 4. Partners are different from major recurring villains (like Team Deception), though both require permission from a mod. 5. Partner's pokemon team shares the level average of the main's team. Upon creation, they can have any pokemon under the sun (except legendaries, pseudo-legends, and fossils) and can obtain more (make requests in capture request thread). Evolved pokemon are also allowed, so long as the total levels remain in the level average. Appearance: Lyla is what most people would call a classic cheerleader type. Curled blonde hair lies perfectly past her shoulders and her shoulders are in line with her hips, providing her a crisp hourglass figure. Her eyes are hazel and are always wide and bright above a naturally smiley face. She dresses very well, following her own motto “Respect your looks as you respect your health” and so must make the effort as long as she is alive and kicking. On hotornot, she is currently scoring a 9.4 – watch out, boys! Personality: While fairly even-tempered, Lyla likes to have everything planned out meticulously and recorded in a little pink diary that she takes everywhere she goes. She even plans the week’s meals ahead of time and organises what time they should be to fit into her schedule of studying and Pokemon training. When something disrupts her plans, the little diary always makes an appearance for Lyla to re-arrange her life to the finest detail once more. This can be a problem in battles when he plans don’t work out as expected. She is a nice girl, friendly and polite, but would rather that her friends arrange appointments to be sociable, rather than drop in unexpectedly for a chat. Biography: Growing up in Mauville city, Lyla watched many trainers come by and collect their gym badge from Mr Wattson and always wondered what a real gym match would be like. School, however, took her away from a training lifestyle until one day she took a wrong turn on the way home from school to investigate a strange crying sound. This led her to the Daycare center nearby where a myriad of adult and baby Pokemon were residing. Taking an immediate interest in the different pairings and wailing babies that arose from the multi-coloured eggs triggered her to factor studying Pokemon Breeding into her normal school studies. An opportunity to enrol at the Pokemon Academy on the Element Isles south of Johto arose when she graduated in the form of a local competition to draw out a strategic battle plan to submit to Mr Wattson for him to use in gym battles against specific types of Pokemon by using the only Pokemon that live in the Mauville gym. Lyla had tried very hard to make hers stand out, extremely excited about the possibility to learn all about Pokemon breeding like that she had seen in the local Daycare. As a special gift, Mr Wattson also included the donation of Lyla’s starter Pokemon – a bouncy little Plusle with an eccentric personality that causes all sorts of problems that disrupt Lyla’s various plans. As such, her diary has many scribbles since obtaining her Pokemon where changes have had to be made due to the electric-type’s antics. "So, I've gotta do what, exactly?" Lyla looked the Academy representative up and down. He seemed legit - the badge on his blazer's lapel was proof enough, despite the form he was shoving in her face. "Using the Pokemon that Mr Wattson has so kindly donated to you upon winning this competition, you must battle whatever Pokemon I have and win in a sufficient way using the knowledge of tactics that you showed within your entry that was submitted. It's to make sure you really were the one who came up with the battle plan. Plus, we can use the information to assign your dorm at the Academy." The representative intoned. His voice was incredibly dull. Lyla inwardly sighed, then followed it up with an outward one while she glanced at her watch. "Go! 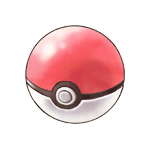 Pokeball!" She tossed the ball high in the air, expelling the Pokemon and neaty catching the ball again where she plopped it into her bag. The white energy released rapidly resolved into a small yellow Pokemon with red cheeks, tail and ears. "A Plusle!" She giggled. Electric types were Mr Wattson's favourite, so she should guessed one would have been her gift from the jolly old man. "Show yourself, Sandshrew!" The representative released his own Pokemon. Lyla's eyes flashed. "Plusle! Use your best Charm attack!" The little bunny jumped and giggled, winking at the Sandshrew and spitting out a large pink heart that popped on the foe's head. Sandshrew balked in horror as the Plusle jumped on him and kiss him ever so softly on the cheek before plunging him into another disgustingly lovely Charm attack. "Use a Shadow Claw, Sandshrew!" Lyla watched with bated breath as the Sandshrew shook off its daze, battled through confusion and successfully hit her Pokemon with a shining black claw. Plusle giggled back. Charm was working. "OK, Plusle. Time to use Quick Attack. Don't stop attacking now until you win!" Lyla shook a fist, really getting excited with her battle. "Sandshrew, return. "” The representative recalled his Pokemon and nodded. His bland face didn't show much pleasure, but at least his words of congratulations did. With a few words of acceptance to the Academy, the representative provided Lyla with a set of forms indicating her enrolment details and bid her good day. The forms were headed "Welcome to Thunder Yellow Dorms!". *Oh great, now my diary needs fixing! * She mused with annoyance as she scribbled into her tiny pink book while trotting home to meet her deadline for her tv show. Her new Plusle, however, laughed merrily and skipped along with a manic smile plastered on its face without a care in the world. After graduating at the Pokemon Academy in the Johto region with a passion for Pokemon phylogeny, Lyla made her way back to the breeding center in Mauville City to learn what she could about Pokemon lineage and the passing of certain egg moves between parents and offspring. As such, she has taken to expanding this research by tailoring her very own research team (detailed below). By breeding, raising and training her research subjects, Lyla hopes to uncover the mysteries of Pokemon attack heritage. To evolve her Skitty with the use of a Moon Stone so that she can attempt to breed the resulting Delcatty with another breeder’s Togetic to pass on the move Wish to a litter of Skitty for sale. To discover the difference in attack capabilities in baby and evolved Pokemon – specifically in her Azurill – by recording before and after evolution. To get Kaki to CALM DOWN. Lyla has travelled to Furoh in search of a Moon Stone where meteorites have been said to have recently fallen on the isle of Fidona. Stethoscope. First aid kit. Pokeballs. Formula. Trusty notebook and pen. I will assume all those daycare pokemon aren't at Lvl 100 or something like that :P.
Appearance: Ven is the average height for his age at an even 152.4 cm and is slightly underweight. His unruly hair is a deep red and his eyes are a bright green; his face dotted with freckles. Ven often wears a pink button-down shirt underneath an overly-large dark grey sweater. He wears dark brown slacks and black shoes with white bottoms. Ven is forced to wear glasses as his parents don't yet believe that he's responsible enough to wear contacts yet - which he thinks would make him look like more of an adult. Personality: Ven can be easily described as a nervous wreck - he is constantly undermining his achievements and worrying over every last detail. He admits to being a coward, although he can hold his ground if he feels that those he cares for are threatened. He is incredibly indecisive and dislikes fighting - a major problem for an up-and-coming Trainer. Ven dislikes it when people talk down to him or make unfair judgements simply because of his age. He tries to act like an adult, but his façade easily fades when he gets scared - which is often. Extremely well-read, Ven depends on his book smarts to help him on his journey through Furoh. Biography: Born into a well-to-do family in Lilycove, Ven was raised from the start to be a prodigy. He was enrolled in various clubs and activities in school and made to enter hundreds of academic competitions, nearly driving him to an early heart attack and leading to the development of his nervousness. Afraid of failure but even more afraid of the future, Ven snuck out of his house one day shortly after he turned seven, determined to stow away on a boat to Johto to, hopefully, live a stress-free childhood. While walking across the bordwalk, however, he slipped on a slippery bit of kelp and fell into Lilycove Bay. Unwilling to spend time on swimming lessons, Ven's parents had never taught him the basics of surviving in the sea, and the boy was sure that he was going to drown. Before he gave up completely, something rough pushed him up toward the surface and held him there, waiting until he caught his breath before slowly dragging him to the shore. A wild Carvanha, swept to sea during a storm on Route 119. After failing to find a way back upstream, she had begun to swim farther out to sea when she noticed Ven fall into the bay. Driven by some hidden maternal instinct, she had rescued Ven and resolved to stay with him. After convincing his parents that the Carvanha was not going to eat the family Skitty, Ven was allowed to catch her. The Carvanha - nicknamed Sharda - immediately set out teaching Ven the way of survival. As the two began to grow, Ven's parents eventually began to let Ven have more freedom, finally letting him decide his own fate when he turned ten. After a short period of intense internal debate, Ven chose to start a Pokemon journey. After three years of preparation (read: reading as many books as he could get his hands on), Ven set sail on the SS Aqua to Furoh, Sharda making sure he didn't get seasick or have a nervous breakdown along the way. Ven's first goal upon arriving in Furoh will to see if he can evolve Sharda. He spent nearly a year reading up on Sharpedos and is about as excited as a thirteen-year-old can get about evolving his Pokemon. Incredibly forward and capable, Sharda is the strength behind the duo. She makes all the truly important decisions for Ven, pushing him in the right direction. No-one is quite sure how she puts up with Ven's shy, uneasy nature, but Ven suspects that she has some sort of natural instinct to help pathetic weak things - not very flattering for Ven, but he does owe Sharda his life. Other Notes: His favourite colour is pink. He's sort of an odd boy. Is this too long? I think it's too long. avatar and trainer sprites made by me. no touchy. It is of proper length. Approved. Appearance: Despite what others think, Lanette’s crimson hair is natural. The result of a birth defect, what would’ve been cherry blonde became striking red, making her an oddity among the other girls. Whatever fates controlled beauty blessed her with striking features, her face smooth and perfectly shaped. Her skin is silky and slick in appearance, a colorful but at the same time pasty tan color. Lanette’s ears are round and her nose is slightly pointed. Her typical outfit, when she isn’t in a contest, consists of a lime-green tank-top and long white jeens, cut at the ankles. She also wears brown sandals and always has a black armband around her wrist. When she wants to dress up for a contest, her favorite dress is a large red ballroom gown, complete with matching headdress and a wand with a small ruby-colored fixture upon it. The dress, obviously, matches her hair. Personality: Lanette is passionate and fiery, always determined to do her best, even in hopeless or otherwise difficult situations. Although contests are more her style, she’ll never decline a challenge when it’s presented. When she isn’t in a competitive zone, she’s one of the most pleasant and compassionate people one could meet, and she cares greatly for others’ feelings. When she can, she helps, even if it’s a complete stranger, and no matter the job. She rarely gets angry, and when she does, it’s short lived and quiet. Lanette’s quick to forgive and forget, and is honest and kind. Biography: Born to a struggling family of four, Lanette was the youngest of two siblings and her widowed mother. Growing up, her only male role model was her eldest sibling, Jason. Her mother was always distraught and stressed, working almost all around the clock to make ends meet. At age three, Lanette’s ten year-old brother went off to try his hand at being a pokemon trainer, coming back after only a year to help the family. Soon after, when Lanette was seven, her older sister, Mylissa, also tried to go on an adventure, but came back even sooner than Jason had. Alto Mare was not a great place to Lanette. Having lived there her entire life, the sights of the town didn’t impress her anymore, and she wanted to see the world. So, at eleven, she also left on her own adventure, expecting to make a success of herself. And she did, but it came in an unorthodox fashion. Soon after leaving home, Lanette found a quaint little dress shop and decided to look around, not having too much money to spend. But she found a dress that just clicked with her, and she knew she had to have it. Asking the cashier how much, she found it would cost her all the money she had. She bought the dress. Immediately following, she left the little town and made her way to Azalea Town. On the outskirts of town, she ran into a young man by the name Vincent Lance, an aspiring young trainer having trouble raising his Totodile. Lanette offered to help train the young man’s pokemon for a short time, and after about a week, the unruly Totodile was tamed. Lanette had grown quite fond of the young man, Vincent, and decided to travel with him for a little while. They talked to one another about life and future plans, having as great time. Vincent even helped Lanette catch her second pokemon, a young Burmy hanging in a low tree. Eventually, Vincent parted with her when their paths split, Lanette going to Hoenn and Vincent going to Kanto. Half a month into her adventure, Lanette made a choice to collect contest ribbons, and so she did. Her Burmy worked extremely well with her Beautifly, and together the three obtained three ribbons. Lanette headed home as fast as she could to brag to her family, only to find her brother home. “Without you?” Lanette asked, unable to think of anything else to ask. “Well, I can’t stay here,” Lanette thought aloud. Then she remembered that Vincent, the boy from Johto, had offered to let her come live with his father if anything ever happened to her. So she headed that way, going straight to Sinnoh and looked up Mr. Lance’s number, finding him on a remote island just off the coast of Sandgem town. She waited there until she was seventeen, and Vincent finally came home, only to announce that he was leaving again. She decided to go with him, having been told that there would be contest halls in this new region he was going to. And the boy was sorta cute. Why not go with him, right? Notes: Mellow, calm, stoic. Usually doesn't go out of its way or spend any extra effort on anything. Notes: Shy, affectionate, but slow to warm up to people. Always tries its hardest, but isn't comfortable around strangers. This is my story series. I'm done posting the second book! Read it! 75% of Roleplayers don't care about doing a good job at Roleplaying. If you are one of the 25% of roleplayers who really cares, copy and paste this into your signature. A male Burmy evolves into Mothim at level 20, so it's impossible to have one at level 10. Profile updated. iPod Approval granted! Appearance: Govannon stands at 5'10''. His long black jacket isn't that much shorter, reaching down to his knees. Beneath this he usually wears a dark buttoned up shirt (but this is rarely seen since the buttons on his jacket, which are around his waist and chest, are usually done up) and black trousers, tailor made so that they're just the right height above his perfectly shined shoes. Govannon himself has a light tan, although only so much that it looks like a normal skin tone. Part of this is due to his skin being contrasted to his deep brown eyes and jet black hair. He has it cut regularly, keeping it fairly short and easy to manage. Personality: Govannon has a great love of pokémon but this isn't usually extended to people. He's not a misanthrope at all, but prefers his privacy and independence. This is partly due to a high (although arguably justified) opinion of his own abilities and other people's abilities to mess things up. He's still polite and civil however, but would rather that other people didn't get involved in his studies unless he knows they're competent, which is what makes him independent since he rarely does anything but research and raising pokémon. He doesn't like being distracted from his studies and research though, and is very easily annoyed. He won't get angry at people when annoyed but won't bother hiding it. He's interested by history and pokémon. History of pokémon is easily his favourite subject. These interests most likely come from visiting the Pewter Museum in his youth. Biography: Govannon was always an only child but it never seemed that way. Him and his parents often visited his father's brother's family in Celadon City. They had a daughter a few years older than Govannon, named Amy, who was more like a sister since they first met when he was only an infants It was on a trip to Viridian Forest when they were 10 that Govannon found his first pokémon. The pair of them came across an abandoned egg. It was in tatters, it had cracks on it and was clearly unwanted. They tried to find any pokémon it might belong to but none took it. They could only assume that it had been abandoned by a trainer, so took it to the pokémon centre to get it checked over. Everything was fine, and with a little care from Govannon it hatched into a Pichu a few weeks later. She and Govannon were inseparable, and have been ever since. When Govannon was 13 Pichu evolved into Pikachu, and three years later he invested in a Thunderstone and evolved her into Raichu. Shortly afterwards he returned to Viridian Forest and caught a Pikachu, a male one. Besides Raichu he went to Viridian Forest alone. By this point him and Amy had drifted apart. They hadn't fallen out, but their parents just weren't visiting so much and weren't a close friends they had been earlier in life. Govannon's family had always been very well off. They didn't splash the cash and live a life of luxury, which was probably what helped them stay wealthy, but lived in a nice house and when they wanted it money was always there in abundance. When Govannon decided to move out aged 17 they bought a large house for him, and gave him enough money to use it how he liked. He used the money to help him study pokémon, building rooms designed for different types to live comfortably. The garden backed onto the forest and was inhabited by many bug and bird pokémon. Since he started his career as a pokémon breeder he raised a lot of pokémon in the centre, including the offspring of his pet Pikachu and Raichu. Pichu was too much of a handful however and needed a trainer to take care of her, not someone who stayed indoors all day working. Pichu was sent to his cousin Amy, who had become a teacher by this point. It was given to one of her students, Malcolm Smith, in return for spending more time working and less time playing with his pet Pidgey. When Govannon was 22 the centre was almost empty. Besides his personal pokémon (Pikachu, Raichu and Mime Jr, who he obtained from a visitor to the centre in a trade for a Growlithe he caught on his travels) the only one left was Charmeleon, not counting any that strayed into the garden. Things seemed dull until someone arrived with an interesting discovery. Govannon had developed a local reputation for knowing quite a bit about pokémon, causing the owner of a Charmander egg to visit him. The egg was no ordinary egg however, it was much smaller than normal. It was a little over half normal size and apparently came from an island where the pokémon where equally miniature. This island was near a far off region called Furoh. Govannon's curiosity at this relatively new discovery got the better of him. He gathered the pokémon and locked up the shelter, making his way to study these pokémon and find out what made them this way. It was the first time he'd left Kanto but he wouldn't be gone for much longer than he was for any other trip, maybe a month or two at most. At least, that's how he planned it. At 5 feet, 5 inches, Nate is a pretty small guy. He even has a young looking face with little facial hair, causing him to look very much like a 15 or 16 year old. This does not stop him from wearing grown man sized clothing, however. He wears shirts and sweatshirts that are very baggy, though his pants are pretty well fitting. He shaves his head when his hair starts to grow out more than a little, but when you can see it, it's black. He has a high pitched voice and a really sweet smile. Personality: Nate is loud. Quite simply, he loves the sound of his own voice and he loves to pick fights. That combination is quite deadly, especially for a guy so tiny. Growing up in the urban areas of Petropolis, he got into a lot of fights and lost a conservative majority of them. Realistically, he didn't win any. Even still, he continues to pick them, and tries to be as intimidating as possible. He's sort of like a blowfish, except instead of physically inflating himself, he does so verbally. Others might call it a Napoleonic Complex, but I'm not sure they know who Napoleon was in Furoh. Talk aside, Nate is actually a really nice guy and even somewhat of a romantic once you get to know him. He doesn't let many people in, however. Biography: He grew up in a rather poor part of Petropolis. He went to school sometimes, but the whole experience really was quite miserable and there wasn't enough pressure from his family to keep going. In fact, his father mentioned, half jokingly (but also half seriously) that he should just drop out of high school and get a job to help the family. Nate probably would have if it weren't for his girlfriend at the time, Julia, who really wanted him to stay in school. His senior year, however, he barely passed, while Julia got a full ride to a great university in Kanto. The notion that he could go to college hadn't even crossed his mind until Julia said her goodbyes and went off to work at being successful, while he got a job at the Raging Tauros, a burger place walking distance from his house. It didn't take a week for him to realize the restaurant business was not for him. Well, maybe it could have been, but not working the fries. He wanted to own a business. Restaurant, insurance, it didn't matter. He wanted money and this barely above minimum wage job just was not cutting it. But there was little else to do. His parents were kicking him out now that he was 18, and so he had to find a place to live an work full time, leaving him literally no time to think about continuing school, and really, he didn't consider himself smart enough to go back. And he was pretty much right about that. Petropolis Independent School District clearly failed young Nate. He had always been interested in pokemon. Pokeballs were fairly expensive, though, and so he could never actually catch one. But one of his favorite things to do when he was a kid was to get together with some friends and go to the richer side of town and watch the rich kids pokemon battle. Specifically, there was one time when he, as a 10 year old, stole a kid's empty pokeball, hoping it would have a pokemon inside already. There was not one, however, and so he was determined to use it to catch one of his own. That's when he hiked with a group of friends to the beach and caught himself a krabby, which na named Pinch. He and Pinch spent a lot of time together when Nate was a kid, but they didn't do a lot of battling since his neighbors didn't have pokemon, and he didn't want to risk the dangers of fighting wild pokemon. So for a while, Pinch was more like a pet. Flash forward eight years to when Nate graduated high school and got a job. In most of his down time, he was looking for an apartment, but one weekend, about a month after graduation, he took a weekend and got a ride to Fidona specifically to test Pinch's power and see if he couldn't catch himself a cool new pokemon. It was expensive, but he went out and bought himself a pokeball. This trip resulted in the capture of Numel, which he nicknamed "Da Bomb," perhaps for its fire attributes. At 20 years old, he works 40 hours a week and rarely battles with his two pokemon. He does hang out with them at his apartment (which he lives in alone) but they are more like pets than partners. That was until one day when he took a cigarette break at the Raging Tauros. He didn't have a lighter, though, so he pulled out Da Bomb's ball, summoned him, and got him to to cast a small ember on the cigarette. It was a little too big, but it ended up being alright. This was not out of the ordinary. Having a fire pokemon had those kinds of perks. What made that day different, however, was who oversaw. It looked like a group of men on their lunch break, coming to get a burger before a meeting or something, but they talked to Nate about his pokemon and asked him why someone with such a powerful pokemon was doing something so menial for money. Long conversation short, they convinced him to join the nefarious Team Deception. He was partnered up with another new recruit, Justin Smart. Together, they made up Unit 101. Both were given a shadow pokemon to commemorate their joining. Nate's was a very young teddiursa. Oh, and for everyone else reading this, the mods know about the Team Deception part. It's a test, so hold off on having your characters join Justin. Hometown: Pheanac City (Orre) But he now lives in Gigarte. Thomas is thin and light. He's about medium height. He has blond hair, which is quite dark, so more like a very light brown, and green eyes. He wears a blue/black striped T-shirt, white trousers and brown shoes. He is quite strong, and not very fast, although he can run quite fast if the need arises. Personality: Thomas is nice to anyone he meets, even strangers. He's always been this way, mostly due to his loving upbringing. Thomas has a thirst for battles, and is couteous, if sly, to his opponents. He loves his Pokemon dearly. to him, each and every one is as important as the others. He has distinct thoughts about right and wrong. He's quite competitive, but not overly so. And an important thing about him; luck seems to follow him wherever he goes. Thomas, although only 14, already is very mature for his age, and the fact that nothing too bad has happened to him, unlike Alex, has improved this trait. However, he is still very young at heart, and misses his mother deeply, so often likes to go back to visit her. Biography: Thomas was born into a normal family in Orre, one year after the fall of the Ein institution. He therefore has heard many fantastic stories of Shadow Pokemon, but to him they are legends, not reality. He instead concentrates his life on being a Pokemon trainer. As a child, he was never too fussed abut winning any sort of Pokemon League or GRand Festival. He just loved Pokemon and wanted to train them up. Once he was ten, he went to visit a little Lab where some scientists gave away free Pokemon for ten year olds wanting to start their journey. Tom received a Pichu, anmd called it Rai. From then on, Tom worked very hard to train and catch more Pokemon, so much so that within only three days of capturing his second Pokemon, Rose the Budew, both his happiness evolutions occured. A couple of years later, at the age of twelve, a famous Trainer Known as James Mack came in the visit Gigarte. 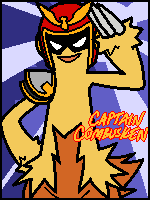 Mack was and still is a renowned Pokemon Co-ordinator. His aim was to seek out the rarest of Pokemon, Shony Pokemon. The only Pokemon that James Mack owned that was non-shiny was his starter Pokemon, Mudkip. Mack owned around thirty Pokemon at the time, including his team of his favourite Pokemon Marshtomp, shiny Bayleef, shiny Charmeleon, shiny Swellow and two shiny Staryus, one of which was ready to evolve, the other being much weaker at level 10. During his visit, Mack was demonstrating Co-ordination skills, and he sent out his Bayleef to do so. Some greedy boys ran on stage and grabbed the Bayleef. Tom knew these boys well, they'd tried to bully him without any sucess, so when Mack asked for help, Tom was the only one brave enough to do so. Tom found the boys and his Pokemon Beat them up, and he freed Bayleef. Mack was so grateful towards Tom for saving one of his best friends that he said Tom could have anything. Thomas shyly declined this, but Mack insisted, in the end giving him the weaker shiny Staryu that Tom still has to this day. Before leaving, Mack expressed his hopes and beliefes that Thomas would one day take up co-ordinating, and this lead Thomas to do what he does now. He met Alex shortly after, and they quickly became good friends. Moves: Mega Drain, Poison sting, Stun Spore, Sleep Powder. Breif Pers. and His. : Rose loves herself. She will sepnd ages training her body to be better, and is totally in love with the scent of her flowers. Thomas caught her on the egdes of Gigarte, as a Budew, and they quickly fromed a bond. Moves: Quick attack, Thundershock, Thunder Wave, Tail Whip. Breif Pers. and His. : Rai is an entusiastic fighter, with not a dissimilar personality to Thomas himself. Rai was Thomas' starter Pokemon, whom he received as a Pichu. Moves: Rapid Spin, Tackle, Water gun, Protect. Breif Pers. and His. : Thomas' Staa was received to him by a famous travelling shiny trainer known as James Mack. Mr Mack spent ages getting all the shinies in the world, and Thomas was lucky enough to receive one of two Staryu shinies that James Mack had. Moves: Supersonic, Peck, Wing attack, Focus Energy. Breif Pers. and His. : Tweet was captured by Tom Hawk a few days after the capture of Rose, in roughly the same location. Tom sent out Rose to fight this Taillow, and immediately both refused to fight. By a remarkable turn of luck, the Taillow allowed Tom to capture it without struggle. Since then Rose and Tweet have seemed to get on brilliantly, as if they knew eachother before Rose's capture. Items: Bag, Poketch, Great balls (5), 20 Pokéballs, a Phone, a bike. Let's avoid the TM moves for now. They all seem overpowered at that level. I edited the moves for you. I wrote this up ages ago, and I didn't look much at the Pokemon section. Anyway, the only TM move there now is Protect for Staryu. Roselai and Taillow each have a status-related egg move, Roselia's being Sleep Powder and Tailow's being Supersonic. I hope that that's OK. Appearance: More than a little on the short side, RC is petite and, in an attempt to make up for this, keeps her long black hair in a high ponytail near-constantly. When let down, it hangs perfectly straight and makes her red-pink eyes look somewhat frightening. RC can usually be found wearing a strapless, deep lavender top over a short purple skirt and red tights. In addition to this, she wears a very long, flowing purple scarf and red arm warmers. There is a tiny earring on her left ear that is shaped like a Duskull's face. If the need arises for formalwear, RC has a plain, light purple dress with a darker purple trim - along with a matching hat, purse, and shoes - hidden somewhere in her ordinary clothes. Beat has yet to figure out exactly how she manages to do this. LuxNotes: I recently shelled out some cash and bought The Art of Phoenix Wright: Ace Attorney and this is my sad, sad attempt to replicate the style. RC's design was inspired heavily by the three main heroines of the AA games - Maya Fey, Trucy Wright, and Kay Faraday. Personality: Fiercely independent, RC refuses to become a puppet for someone else's goals. Loud, hot-blooded, and very hyper, RC is the bane of a nobleman's existence. By default she seems to have an intense dislike for 'girly' things, often protesting at the mere mention of dressing up. Despite all this, she can act surprisingly polite and shy when pressured enough - a throwback to her youth, it seems. Around Pokemon, RC's entire attitude does a 180. With an all-encompassing love for every Pokemon - except Nosepass and Probopass, have you seen those things? - RC can be reduced to girlish giggles in seconds, simply from being in the same area as, say, a Skitty. This carries over into her battles - RC's aim is incapacitate, not harm. In both an effort to separate herself from the past and to get over how ridiculously feminine Reneé Cheryl sounds, RC abbreviates her name. Biography: Reneé Cheryl Desmarais-Moreau was the only child of Martin Desmarais and Colette Moreau, two extremely wealthy Bluebloods who lived in Ecruteak City. Because of the rookie doctor's inaccurate guess, Reneé Cheryl was born a month earlier than expected, while her parents were vacationing in Martin's hometown of Pastoria City. Unwilling to risk her little angel's life on the 'dangerous' aeroplane ride back to Johto, Colette forced her family to stay in the summer house in Pastoria until she deemed it safe for little Reneé Cheryl to travel. Against Colette's dearest wishes, the girl grew up less feminine than she desired, often sneaking out of the house in the dead of night to explore the marshes with her Chatot, Eloise. It was here that RC began to develop her off-the-wall nature and love for Pokemon - having grown up behind the iron gates of the summer house, the wild and unpredictable ways of the Pokemon intrigued her. Her time in the marshes ended when her mother finally snapped and enrolled RC in singing and piano lessons, hoping to tame her daughter's rough ways. While her voice was nothing short of beautiful and her skill at the keyboard amazing, RC put no heart into what she did, infuriating her mother. One night, Colette announced that they would be returning to Ecruteak the following day. Upset, RC managed to sneak out of the house one last time, heading west instead of north to the marsh. RC and Eloise spent the entire night on the move, not resting even when they arrived in Hearthome. Determined to stay in Sinnoh, RC made her way to Route 209, planning on hiding in Celestic Town. Before she could get that far, however, she was attacked by a Duskull. The fight was long and took most of the night, but in the end, Eloise managed to knock out the Duskull. RC decided to use one of the Pokeballs she'd stolen from the manor and caught the unconscious Requiem Pokemon - just as her mother's search party arrived. I'll be back when I become the Pokemon Champion. RC’s current aims: RC's aims are twofold: one, become the Pokemon Champion - or at the very least, a decent trainer - and two, avoid her mother for a few years. Other Notes: As stated above by my brother, RC's design was heavily influenced by various Phoenix Wright characters. RC's name, as well as that of her parents and Pokemon, are all French. Desmarais means 'from/by the marsh', a nod to her connection to Pastoria. Cheryl is a shout out to Silent Hill. Her favourite colours are red and purple. All trainer sprites made by me. Do not use without my permission. Lyrics from 'Saferwaters' by Chevelle. Yes, but why did she go to Furoh of all places? I'm in love with her sprite . The ferry in Olivine was en route to Furoh, and she thought 'Why not?' Lux told me that Furoh is very far away from the other regions, so she'd probably find it safer to be there then somewhere like Kanto. Going back to Sinnoh would be fairly obvious. And thank you. It took me a few hours to get everything right. OK. Now add that to her Bio. Approved. Karen is tall and somewhat thin. She has sky-blue eyes, long brown hair reaching just above her waist but usually in a high ponytail and normally tanned skin for a eighteen year old. Her hair partially covers her left eye and her face is clear of any marks that stand out. Karen can normally be seen wearing a somewhat dark green shirt with sleeves reaching up until half of her forearms covered by a black top. On the lower part of her body she wears light brown leggings as well as a pair of boots of the same color. Karen also carries a small satchel (the same color as her shirt) that contains basic trainer equipment: potions, antidotes, medicinal herbs, spare Pokeballs, etc. She does, however, have a digital item storage account where she has a lot more items than she can carry. Determined, friendly and confident when Ashura's around, Karen can make a great companion. Essentially she likes to focus onto what she's doing and finish it no matter what. Her friends and Pokemon are also one of her main concerns, seeing how they're always there for when she needs them. She likes finding and exploring all sorts of ruins and dungeons thanks to a field trip when she was little. She's clever enough to decipher the puzzles and traps of sorts from these locations but there are some times when the challenge just seems to too big to be handled alone. She mostly relies on Ashura for battling, adopting a "hit them hard and fast" strategy which, taking in account Ashura's natural abilities, proves to be rather efficient to some degree. Karen was born and raised in Azalea for about twelve years. She didn't have much friends there due to her curiosity (mostly because it often led her to trouble), excluding Tyson Ealdwine, a kid who had lived there with his grandparents after losing his parents in an accident. 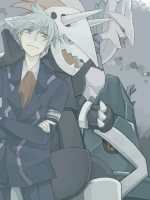 They were great friends until the day they parted ways, she leaving for Unova while Tyson remained back in Azalea. During her trip to the region of Unova the ship underwent a bit of a predicament. People who called themselves Team Plasma took said ship under control and with the united forces of the passengers they were defeated. Karen, however, still lacked any kind of Pokemon and thus a rich old man offered her a Scyther to help during the whole situation and, in the end, insisted that she could keep said Pokemon. First thing Karen did when she got to Unova was to head straight to Relic Castle, some newly found ruins in the desert just above Castelia City. Ever since a school trip to the Ruins of Alph when she was little Karen was interested in archeology and ancient mythology and myths thus it was only natural this was the first place she visited in search of treasure of sorts. She found treasure, all right, if not a rather unusual one. A gentle voice echoed through her mind, scaring her a bit. She turned to see a calm Riolu looking straight at her and Ashura next to a statue representing a Pokemon known as Liepard. The Emanation Pokemon was probably left there by some other trainer from another region, seeing how only Unova Pokemon were native to the region itself and seemed to be able to use telepathy to some degree. Not only that but his skills allowed him to sense both humans and nearby traps which could prove helpful. She took a Pokeball and, without any resistance, the Riolu accepted his new trainer. A few years went by and news reached from a region called Furoh that new discoveries were constantly being made. As such Karen didn't think twice and traveled to yet another region, this time prepared with her two new partners. It's going to be a great journey. Obedient and vicious Ashura isn't someone to take lightly. He will begin and finish his fights with a combination of power and agility. He can lower the opponents defense, focus himself up to get more critical strikes or even raise his already high speed to insane levels. He's Karen's main fighter as well as self-chosen guardian. Calm and always aware of his surroundings Flowne keeps his cool in all situations. He can scout out opponents, people and even traps with his natural abilities and power it further with his Foresight. He's also a decent battler capable of paralyzing an opponent with a well placed Force Palm or even break through its defenses. Flowne is also able to utilize telepathy to a small degree, an ability that is sure to grow stronger as he does too. Other Notes: None as of yet.